The first question you’ll be asking before investing will surely be, how much money can a holiday let make? Calculate the return on investment for each of the properties you are considering for an easy way to compare properties and identify the most profitable. Once you have all these figures, you can easily calculate the predicted income for a holiday let investment. 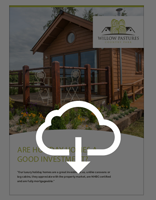 For a detailed, step-by-step guide to calculate return on investment for holiday homes, download The Ultimate Guide to Buying a Holiday Home.